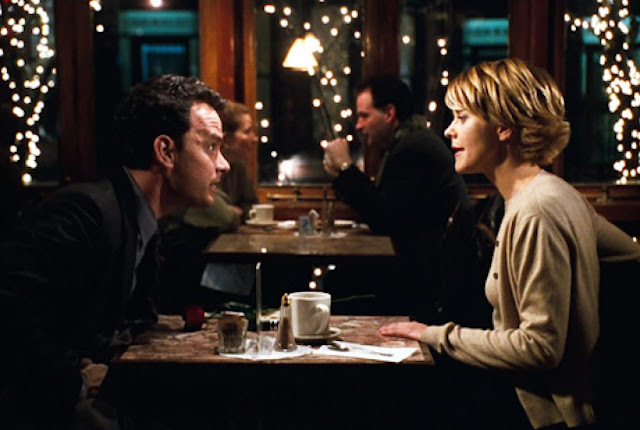 Just rewatched You've Got Mail with Meg Ryan and Tom Hanks, a,1998 film based on the 1940 film, The Shop Around the Corner. It stood up to the test of time, despite the obvious advances in technology (for one, I am writing this on Facebook via my Kindle, a technology which has nearly eclipsed the big box bookstores). I was enthralled by a few things: the Ephron sisters' script that repeatedly referenced and reflected Pride & Prejudice; the very solid Godfather references; and the Manhattan-ness of it all. And what a cast! Dave Chappelle as the sidekick (! ), the erstwhile Greg Kinnear and inimitable Gene Stapleton. And lest I forget, a waspish Parker Posey. I can definitely see another remake of this story within the next 60 years. Anyone care to predict the remake of what they dare to predict is a modern classic? Patrick McEvoy-Halston I love it. It's ebullient froth, life and charm. I remember one critic said that after reading Updike he is reminded as to why he took upon himself all the bother of learning to read--here folks, is the pleasure and joy. Also, it does have an interesting Freudian theme, even if registered unconsciously. The "father" steps in to enforce separation from a "mother" whose influence (only hesitatingly overtly acknowledged) is smothering a child's full development. The father is "Fox Books," of course, and the "mother" is the little shop, which speaks to her mother's accomplishments rather than her own. Done of course with great love of the departing mother, and exaggerated targeting of the rescuing father. It may be the film is only incidentally coincidental with real-life changes to the book industry, and really mostly reflects some known truth about Nora Ephron's early life. (Playing now at Joe's Apartment / 152 Riverside Drive, Between 87th and 88th Streets). Lisa Salazar Love your take on the film; is the film you are referring to something else or YGM? Patrick McEvoy-Halston Lisa Salazar She was a treasure. Laura-Jean Kelly Dislike this film..something to do w the deceipt at the end and her almost subservant stance to him. He saves her and she's so femininely grateful. Uhh. I've seen it 3 times now cuz i love the actors and always trying to like it but it still smacks of something i cant quite describe in words. She loves me and little shop around the corner are great. Patrick McEvoy-Halston Laura-Jean Kelly Freudian subtext (rescuing father, smothering mother), and most feminists don't really do a lot of Freud right now. The film could have been done where he doesn't actually deceive her, and where she uses him and the destruction he incurs to get out of a life-path that was determined for her, but I don't Ephron was prepared to be overt. Still, in effect it doesn't pretend that finding oneself co-opted into a life that fit some other person superbly but which you, despite its many pro-offered comforts, are uncertain about, is all for the best. The fight in that, the righteous fight in that, is feminist, in my judgment. Posey IS great in that film. So too the rest of the supporting cast. Love them all. Laura-Jean Kelly Just that to like this film and believe that the original beguiled is misogynist which i dont believe but i think Lisa Salazar you did is an example of what s wrong with the depiction of women in modern times in some of these newer hollywood movies and why we have the name chick flicks. Oh well. Lisa Salazar Laura-Jean Kelly, I get you. But at the same time the look on her face when she "meets" him is just priceless. She wants it to be him, she's shocked, she's betrayed, she's in love. It is not a beautiful face but it's real. How did she pack that all in one look? Heartbreaking. Laura-Jean Kelly Yah. Meg Ryan highly underrated.